Drab clouds didn't do a lot for the psyche today. Winter has officially set in. And the days of above freezing temps are numbered. Ironically though, while the days continue to shorten until the 21st, the sunsets will get a little later starting tomorrow. Granted, it's just by about 9 seconds, but we gotta start somewhere, right? We await the arrival of the cold with a partly sunny day in the 40s tomorrow. 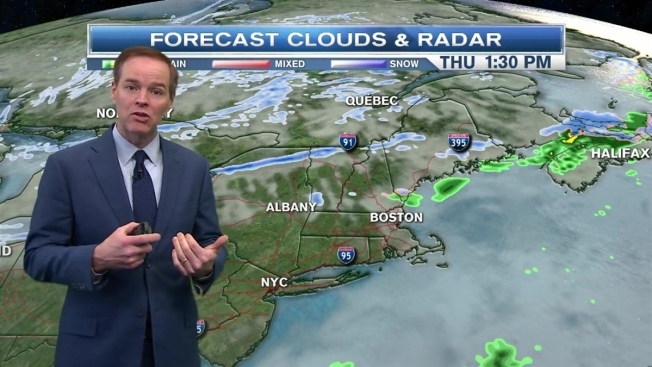 Nothing special, but with increasing westerly winds and developing mountain flurries and snow showers over Vermont, you'll know something is changing. That change will be brought about by a cold front. It charges through late tomorrow night and Friday morning with a boisterous wind and plenty of chill. Hig over the weekend will struggle to make freezing. Meantime, a storm will be marching across the U.S. When it arrives, it will attempt to pry out the cold air with a warm front. Fat chance? I wouldn't say that, but the cold won't go quietly. Expect snow, ice and eventually rain. And it lands just in time for the morning ride. Yeah, I just typed that. Be forewarned that the Monday AM commute looks nasty with icing likely Metrowest and Greater Worcester. What follows will be the coldest air we've seen in three years. With more cold in the pipeline through mid month, there won't be any 70s in your Christmas stocking this year.